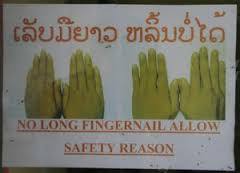 After i’d been traveling for two-and-a-half weeks, i really needed to have my fingernails cut, so i walked a couple of blocks in Vientiane, Laos into the nearest hairstylist. She did my fingernails and c leaned up my feet, which had been in flip-flops for 16 hours a day. Those lavender flip-flops were already brown with dust, so perhaps you can imagine my feet. “Why did you move back to Laos?” i asked her. “Oh, my kids didn’t like it there,” she said. That surprised me. I wondered if she meant they were bullied because of their accents or their lack of English. By this time my fingernails were trimmed, and my toenails looked better than they have in a long time. This entry was posted in DHARMA REFLECTIONS and tagged fingernails, Flip-flops, Philadelphia, vientiane on March 22, 2013 by cherylwilfong.